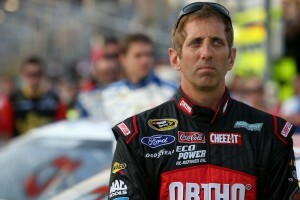 LOUDON, N.H. – Greg Biffle had a novel idea—one that is unlikely to be implemented, but interesting nevertheless. Given NASCAR’s willingness to refine its competition package in effort to enhance the quality of racing, though, nothing is totally out of the question. Whether feasible or not, Biffle posed the following hypothetical during a media session on Friday morning at New Hampshire Motor Speedway prior to Sunday’s 5-hour ENERGY 301 (1:30 p.m. ET on NBCSN). Last week at Kentucky Speedway, NASCAR introduced a new small-spoiler, low-downforce package that won nearly universal acclaim among drivers and produced one of the most exciting intermediate-track races since last year’s season finale at Homestead-Miami Speedway. Next week at Indianapolis, and three weeks later at Michigan, NASCAR will try a higher-drag package with a nine-inch-tall spoiler (compared with 3.5 inches used at Kentucky) in an attempt to give cars a better chance to pass on those tracks. Biffle’s idea is to compare the results of both the low-downforce and high-drag packages under the same conditions at the same race track, a concept that’s not as impractical as it might sound at first. Changing the key aerodynamic elements of the current Sprint Cup cars is a relatively simple process. “I think it’s definitely a bold idea, and the way these cars are, it gives us that opportunity for having the splitter and the spoiler and being able to adjust those fairly easily to change the package around,” Biffle said. “Before, that was difficult to do, because we had a front valance on it, so you could never change the front downforce by changing that pan and the splitter. For a race car driver, winning often is enough to take one’s mind off pain and discomfort, but even when he’s not visiting Victory Lane, Kyle Busch says the residual effects of the crash that sidelined him for 11 weeks is certainly tolerable. Busch broke his right leg and left foot in a Feb. 21 accident at Daytona International Speedway but has won two of his last three NASCAR Sprint Cup Series starts after returning to action at Charlotte in May. “Winning cures all and it seems like last week at Kentucky (his second win), the good runs we had there, my foot has felt a lot better,” Busch said on Friday before opening Cup practice at New Hampshire Motor Speedway. “(But) I wouldn’t attribute it to that. Early on, I probably mentioned at Charlotte that I wasn’t dealing with much pain, and I really wasn’t. There’s times where it flares up and it gets bad, and you have some good days and you have some bad days. The excitement of leading the race at the road course in wine country masked the discomfort Busch started to feel late in the race. “I started to feel a little bit of pain with about 25 (laps) to go,” he acknowledged, “but then you get the adrenaline to take over and get going when you’re having a shot at the win, and you don’t feel anything until the next day afterwards, when everything kind of calms back down. The state of Massachusetts and roughly 180 highway miles separate Joey Logano’s house in Connecticut from New Hampshire Motor Speedway, but if the driver of the No. 22 Team Penske Ford thinks of the Magic Mile as his home track, so be it. After all, success and history are on his side. Two of Logano’s nine career NASCAR Sprint Cup Series victories have come at Loudon, most recently in last September’s Chase race at the one-mile flat track. So Logano returns to New Hampshire for Sunday’s 5-Hour Energy 301 as the most recent winner here—and as the runner-up in last week’s event at Kentucky Speedway. “Any time you come back to a race track that you won at, coming off a weekend that you had a really good run at in Kentucky, the confidence is high in the team,” Logano said on Friday before opening Cup practice. “I think that’s good. That’s what momentum is–it’s just confidence. This is a race track that I’ve always loved coming to. I consider it my home race track. We were running second before we got crashed (in last year’s July race), and then we came back and won the fall race.